His Royal Highness Tuanku Syed Sirajuddin ibni Almarhum Tuanku Syed Putra Jamalullail was installed as King of Perlis on 17 April 2000. 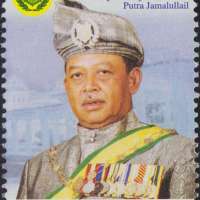 Born in Arau, Perlis on the 12 Jamadilawal 1362 of the Islamic calendar or 17 May 1943, the the second prince from ten princes and princesses of the late Almarhum Tuanku Syed Putra Jamalullail and Tengku Budriah binti Almarhum Tengku Ismail. 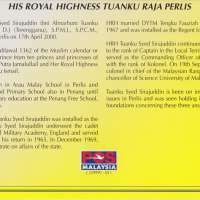 HRH received his primary education at Arau Malay School in Perlis and Wellesley Primary School and Westland Primary School, both in Penang until 1955. His Highness went to further his secondary education at the Penang Free School and later to England for 4 years. 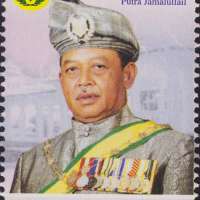 In 1960, while still schooling, Tuanku Syed Sirajuddin was installed as the Crown Prince of Perlis. His Highess underwent the cader officer's course at the Sandhurst Royal Military Academy, Endland and served at the Malaysian Defence Ministry upon returning in 1965. In December 1969, His Highness resigned as Lieutenant to concentrate on affairs of the state. 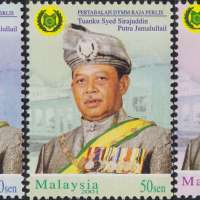 Tuanku Syed Sirajuddin married Tengku Fauziah binti Tengku Abdul Rashid in February 1967 and was installed as the Regent for the first time in the middle of the same year. His Highness continued his military services and was promoted to the rank of Captian in the Local Territory Army until October 1972. He also served as the Commanding Officer of Regiment 504, an Army Reserve Unit with the rank of Colonel. 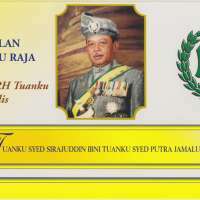 On 19 September 2000, His Highness was appointed as a colonel-in-chief of the Malaysian Rangers, and before that on 17 April 2000 was appointed as the chancellor of Universiti Sains Malaysia in Penang. Tuanku Syed Sirajuddin is a keen on improving Sports, Educations and Religious issues in Perlis and was seen holding important posts in associations, clubs or foundation concerning these three areas.